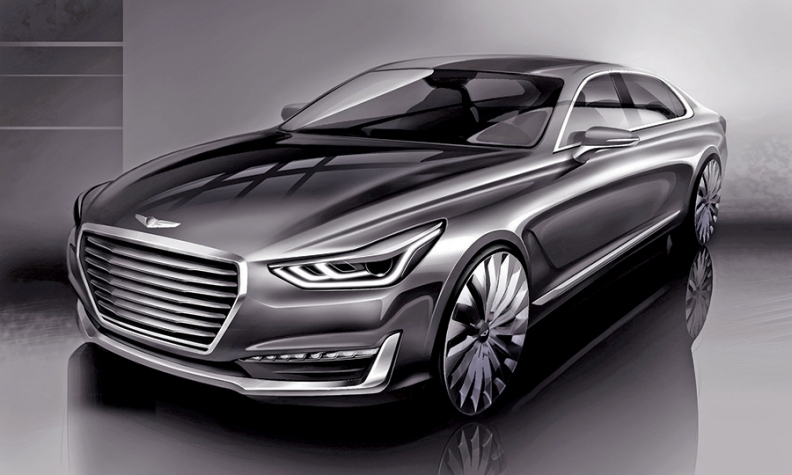 A rendering of Hyundai's Genesis G90 -- the flagship model for the world's newest auto brand -- depicts a low-slung sedan with a long, dignified hood, narrow greenhouse and sloping, fastback silhouette. The South Korean automaker announced plans for a new Genesis luxury brand this month and previewed the design for its first model last week in Seoul. The G90 will be the new brand's range-topping model and a successor to the Hyundai Equus, which will be phased out. Hyundai plans to launch five more nameplates through 2020 under the Genesis banner. Hyundai dubs Genesis' design language "athletic elegance." The large grille is crowned by Genesis' spread-wing emblem and flanked by what Hyundai called "sophisticated" headlamps that aim to communicate a futuristic aura. A clean-cut character line creases the entire side culminating in wraparound taillights. The G90 goes on sale in South Korea early next month as the EQ900. Hyundai aims to sell the Genesis brand initially in Korea, North America, China and the Middle East.